Tennessee’s Orange & White Game on Saturday will be important for the Vols’ current players, but off the field, it’s also an important day for potential future Vol players as well. Several prospects are making their way to Knoxville as visitors for Tennessee’s annual spring game this weekend. Many are from out of state, but there will be some in-state recruits there, too. One of them will be on an official visit when he comes to town. 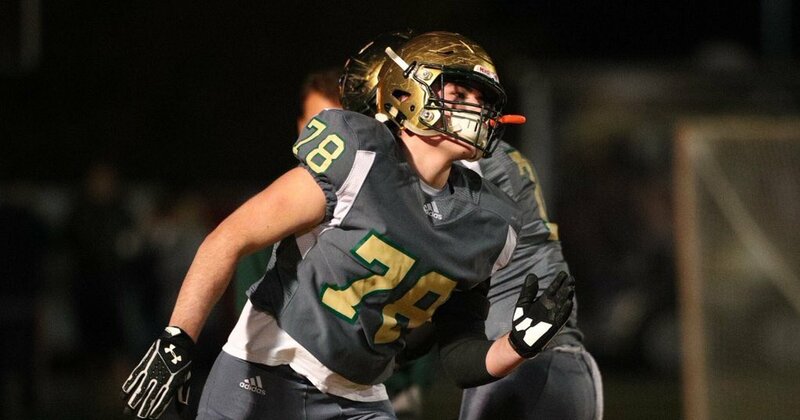 Cooper Mays is one of the Vols’ top overall targets in the 2020 class and is one of their highest priority targets inside the state of Tennessee. On Wednesday night, he tweeted out that he will be taking an official visit to UT this weekend for the Orange & White Game. Mays plays in UT’s backyard at Knoxville Catholic. He plays primarily at guard for Catholic, but he’s also taken snaps at center and tackle. Mays also plays on defense for Catholic and has excelled there, too. According to the 247Sports rankings, Mays is a four-star and is the No. 297 overall prospect and No. 8 player from the state of Tennessee. The composite rankings have him just outside of four-star range, listing him as the No. 397 overall recruit in the 2020 class. Though he’s played mostly at guard so far in high school, Mays projects as a center in college and is graded as such by recruiting services. He’s ranked as the fifth-best center in the 2020 class right now. So far, Mays holds offers from Georgia, Florida, Auburn, Ohio State, LSU, Duke, and several other schools. He’s been on Tennessee’s campus plenty of times during his playing career, and he’s visited multiple times already in 2019. His official visit on Saturday will mark the fourth time this year he’s visited Tennessee. You can get all of our in-depth recruiting analysis and information on Tennessee football and basketball by becoming a member of RTI Premium today! Cooper is, of course, the younger brother of Georgia Bulldogs offensive lineman Cade Mays and the son of former Vol Kevin Mays. The 6-foot-3, 280-pound lineman has been a priority for UT’s coaching staff for over a year. That doesn’t figure to change any time soon, either. Tennessee is looking at him as either an offensive or defensive lineman, and Mays has proven he can play on either side of the ball. Mays is athletic and blocks really well in space, using his speed and strength to his fullest potential. He is incredibly aggressive, but he still plays under control. His footwork is excellent, and he is very strong. Mays’ biggest strength is his ability to run block. He’s a real bulldozer, and he can be seen racking up pancakes on his highlight film. He plays low and doesn’t habitually get too high on defenders, which is always a problem with high school linemen. You can tell he comes from a football family, because he has a strong football IQ and is a very smart player. As a junior, Mays was an All-State selection on the offensive line, and he won the Defensive Lineman of the Year for Region 4-5A in East Tennessee. On defense, he totaled 92 tackles, 13 tackles for loss, six sacks, two forced fumbles, and two pass breakups. Mays is one of Tennessee’s top priorities in the 2020 class, and getting him back on campus for a fourth time in 2019 alone is a big deal. It’s also a big deal that he’s using his first official visit to come to Knoxville. Tennessee and Georgia are seen as the two biggest players in his recruitment, but Mays has kept info pretty close to the vest thus far.